These products are the same in all but their names. So why do 26% of Americans buy the one that costs more? Nine times out of 10, pharmacists and doctors will buy the generic version of aspirin, rather than a brand-name like Bayer. Likewise, professional chefs prefer store-brand sugar, salt and baking powder instead of brand name ingredients. In short, the most informed consumers usually buy generic products, claims a new paper by economists from Tilburg University in the Netherlands and the University of Chicago. Their research estimates Americans are wasting about $44 billion a year on name brands, when they could be buying the exact same products if they switched to cheaper store brands. Store brand products cost on average about half the price of national brands. Take that bottle of aspirin for example. A 100-tablet package of 325 mg Bayer Aspirin costs $6.29 on CVS.com. The CVS version? Just $2.27 when it's regularly priced, and $1.14 when it's on sale. They both have the same dosage, directions and active ingredient. But about a quarter of sales on headache remedy drugs in the U.S. go to brand-name products. So why then are some consumers paying so much for Bayer? The paper suggests ads are more likely to mislead all but the most knowledgeable consumers. College-educated shoppers, for example, are less likely to get duped into buying the more expensive brand-name than the broader public. Meanwhile, the experts -- like pharmacists and physicians -- are the least likely of all to buy the brand name drug. Whereas the average household buys brand-name pain killers like Bayer, Advil and Tylenol 26% of the time, pharmacists buy brand names only 9% of the time. A similar trend turns up at grocery stores. The study used Nielsen data tracking 77 million shopping trips by about 125,000 households. In addition to aspirin and baking supplies, it also tracked groceries like milk and eggs, soda, and cereal, and other healthcare products like cold remedies, bandages and contact lens solution. Contact lens solution was the only healthcare product where the smartest consumers perceive "true quality differences," the study said. 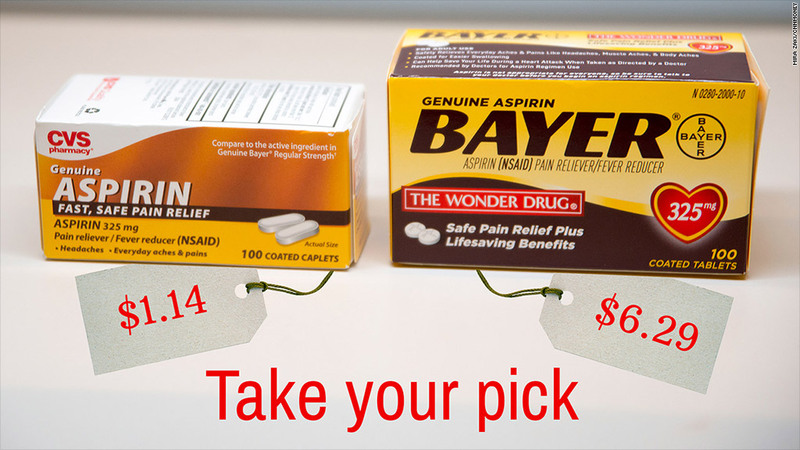 Correction: Originally, this story linked to a bottle of Bayer aspirin that cost $6.99. That price was for "safety-coated" tablets. We've since changed the price to $6.29 to reflect regular aspirin, so we're truly comparing Bayer to the comparable CVS product.